A quadrilateral with two parallel sides is called the Trapezoid. It may also be named as the Trapezium in major parts of the world. The two sides that are parallel in Trapezoid are known as bases and the non-parallel sides are known as the lateral sides. And the distance between two parallel is named as the altitude. There was an interesting argument between schools where one professor claimed that trapezoid has only one set of parallel sides while other professor claimed that it may have more than one set of parallel sides. Based on the second definition, it is considered that the Trapezoid is a special case of the parallelogram. At the same time, the first statement does not consider a parallelogram to be a Trapezium. The diagonals and the base angles of a trapezoid would be equal. When a median is drawn on a Trapezoid then it is parallel to the base and its height would be the average length of its bases. The point where diagonals intersect is colinear to the mid-points of the opposite sides. The concept of Trapezoid is frequently used in various physics computations and advanced mathematics calculations. Also, this is a part of the study during school days and competitive exams too. If you wanted to go into engineering then a depth understanding of the concept is necessary. Here, we will discuss how to calculate the perimeter of a Trapezoid. a, b, c, d are the lengths of each side. 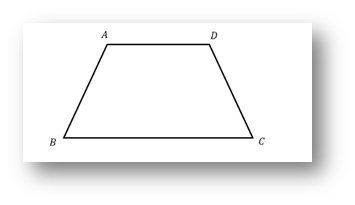 a and b are the parallel sides of trapezoid.